Segmented worms are any of the species of worms belonging to the taxonomic phylum Annelida. They are best known for the segments that divide their body externally by shallow ring-like constrictions, and are separated internally in many species by septa. They include the polychaetes (meaning "many bristles") that have many bristles on their body, and the earthworms and leeches that have fewer bristles. There are about 9000 species of annelids known today. 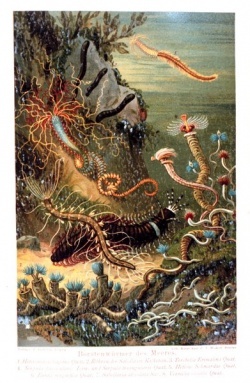 Annelid is made up of segmented worms divided into three main groups: Oligochaetes - earthworms and aquatic worms such as Tubifex, Polychaetes - Nereis and thousands of other species that live mostly in muddy marine habitats, and Leeches, also known as Hirudinea. Their segmented bodies, similar internal anatomy, and developmental stages unite these diverse worms. The annelid has an extensive closed circulatory system. Hemoglobin-containing blood moves anteriorly in a dorsal blood vessel and then is pumped by five pairs of hearts into a ventral blood vessel. As the ventral blood vessel takes blood toward the posterior regions of the worm's body, it gives off branches in every segment. Annelids can reproduce asexually or sexually. One type of asexual reproduction takes place through a method called fission. During fission, the rear end of the body splits from the rest of the body to form a new annelida. Many other taxa (such as most earthworms) cannot reproduce this way, though they will regrow the posterior most segments in most instances. Sexual reproduction takes place by species that are hermaphroditic or species that have separate females and males through cross-fertilization. During sexual reproduction, fluids are transferred from the male pore to the female ovipore. Annelids tend to mate when conditions are moist or following a rain, meaning they may mate quite frequently throughout the year. Hermaphrodite annelids like earthworms mate periodically throughout the year in favored environmental conditions. Annelids mate by copulation. Two worms which are attracted by each other's secretions lay their bodies together with their heads pointing opposite directions. Earthworms are hermaphrodites and can reproduce in three different ways. Although they will not undergo fission, they are capable of fragmentation regeneration and may also go through budding, which is a process where a creature will grow another copy of itself like a branch. This new copy will then be detached and continue to live and grow as an independent organism. Both of these processes are asexual. Earthworms will also undergo sexual cross-fertilization. Also most polychaete worms have separate males and females and external fertilization. The clitellum, a smooth girdle about each worm secretes mucus, after which the sperm leave the sperm ducts and travel to the seminal receptacles of the partner. The clitellum later produces a slime tube, which is move along over the head of the worm by muscular contractions. Into this tube are deposited eggs from the oviducts and sperm from the seminal receptacles. The slime tube forms a cocoon within which the miniature worms develop. There is no larval stage. Annelids are found throughout the world, from deep ocean bottoms to high mountain glaciers. They live in protected habitats such as mud, sand, and rock crevice, and in and among other invertebrate animals, such as sponges. Many live in tubes they secrete around themselves. The most significant ecological role acted by annelida is reworking of soil and sediments. they ingest and excrete large quantities of sediments or soils. Annelids are important components of their respective habitats, whether it be the bottom of freshwater or marine environments, or the soil. The feeding habits of many species are important in the decomposition of organic matter and recycling of nutrients in terrestrial and aquatic environments. Many annelids feed on algae, insects, carrion, and other worms, and several leech species consume the blood of turtles, birds, fishes, and mammals. This page was last modified on 17 August 2014, at 20:48.